Rangers defender Clint Hill admitted it took just one game for his eyes to be opened to the standards expected of him at Ibrox. The Light Blues were frustrated on Saturday when Hamilton spoiled their Ladbrokes Premiership comeback party by claiming a 1-1 draw. Hill and former QPR team-mates Joey Barton and Niko Kranjcar made their league debuts but the star of the show was Accies’ Ali Crawford, who struck a sensational opener to put Martin Canning’s team ahead at Ibrox. 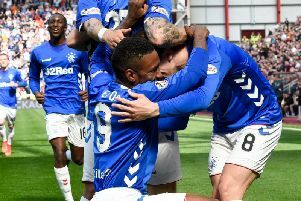 Gers eventually levelled through Martyn Waghorn but not before the sold-out home support let their side know just how dissatisfied they were with a series of loud groans. That left veteran centre-back Hill in little doubt he will have more demands placed on his shoulders by the Rangers faithful than any other support he has played in front of. However, he hopes Tuesday night’s 5-0 Betfred Cup romp over Peterhead will have won him some grace ahead of Saturday’s league trip to Dundee. The 37-year-old said: “Last Saturday was an eye-opener in terms of expectation levels, definitely. Even just walking out of the tunnel, you know what’s expected of you. “Unfortunately we couldn’t finish Hamilton off and get the three points so Wednesday night was a positive in terms of coming out, getting on the ball and taking our chances, which is the most important thing. “I think if we’d taken our chances on Saturday then we’d have come away with three points. Unfortunately we couldn’t and it was a disappointing result and the fans let us know. We’re at Rangers and you don’t want to drop points at home. Kranjcar fired Gers ahead against Peterhead with a sensational opener then sent over two corners which Hill finished off as he grabbed his first goals for the club and his maiden brace. The crushing win was completed thanks to a Fiacre Kelleher own goal and Joe Dodoo’s second Gers strike since signing from Leicester. Boss Mark Warburton had used the occasion to give some of his other recent recruits like Matt Gilks, Lee Hodson and Jordan Rossiter time to acclimatise to their new surroundings and Hill believes the new faces are quickly finding their feet. “It was a chance for us to make a few changes and the boys came in and did brilliantly,” he said. “I thought young Jordan Rossiter showed his promise again. Joe scored his first Ibrox goal, which was brilliant. Hill was one of nine summer signings made by Warburton but the influx will not stop there, with the manager hopeful of adding another striker and defender in the coming days. But Hill is not worried about losing his place so soon after making the switch to Glasgow. He said: “That’s something I’d welcome because I think you need four centre-backs. It’s a tough league and if you want to go all the way in the cup competitions as well then it’s going to test the squad.